An international group of experts on the calculus of variations and their applications to materials science will come together (as well as junior researchers and students in PDE) for this upcoming Hot Topics Workshop. This of course covers a broad swath of applied mathematics, but there are certain themes and subfields that the workshop will focus on, including the effective behavior of composite materials, the role of nonconvexity in pattern formation and microstructure in materials, the importance of scaling laws in the analysis of energetic models and their gradient flows, the role of dimension reduction in the analysis of thin structures, and the rigorous and computational analysis of multi-scale and stochastic dynamical systems. 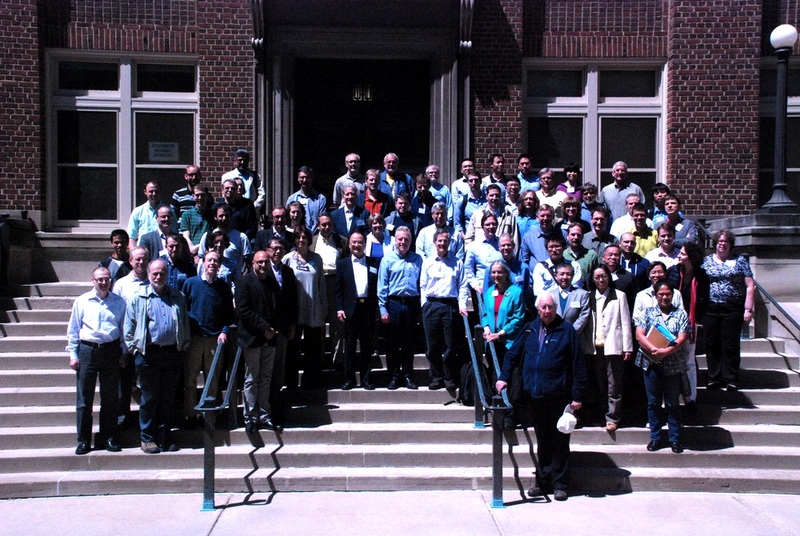 All of these fields and more have been profoundly influenced by the work of Robert V. Kohn and the workshop will in part be a celebration of his impact on applied mathematics on the occasion of his 60th birthday. In addition, a portion of the workshop will be devoted to developments in the theory of homogenization and effective properties of composite materials. By now, these theories have become a key tool in several applied fields, such as optimal design, damage or fracture evolution, inverse problems, and cloaking, to name a few. Moreover, the mathematical theory has provided a common link between these seemingly unrelated applied settings. While the subject as a whole has been studied extensively over the last three decades, until recently, much of the work has concerned materials with bounded contrast. Now, however, there is new interest in composite materials with extreme contrast. This is a crucial ingredient in the understanding of metamaterials, photonic or phononic crystals, and microstructured materials with surprising effects such as negative refraction index. This extreme contrast violates key assumptions in the mathematical theory and raises fascinating new questions in analysis. Another important theme of the workshop will be the role of nonconvexity in understanding phase transitions, pattern formation, and formation of microstructure. The energetic models for various materials of contemporary interest frequently lack convexity. This provides an explanation for some of the patterns that emerge as materials develop fine-scale microstructure through a process of energetic frustration. Mathematically, the associated variational problems typically do not achieve their infimum, or else do so in nontrivial patterns that lead to explanations for a variety of phase transitions. What is more, the relaxation of these energies has provided new insights into the behavior of various materials like shape-memory alloys and ferromagnets. Recent interest has turned to the evolution of this microstructure with time. An important recent breakthrough is the connection between hysteresis and metastable solutions of variational problems. Another important development is the systematic analysis of gradient flows to study microstructure evolution and to study scaling laws associated with microstructure and coarsening as well as the modeling and analysis of nonlocal energies. Of course all of the topics mentioned above have a computational component and another theme of the workshop will be the computational analysis of multi-scale problems. This includes recent efforts to carry out computations on models involving stochastic dynamics.